Emma Hovi is spending her Third Year at McGill University studying history and environment and reports about the student movement at the hosting institution. In planning my third year of the ECLA BA programme, I wanted to use this opportunity to tailor a year to fit what I was interested in. Nevertheless, I found myself worrying over ending up somewhere random, somewhere where I would be disappointed. I wanted to choose wisely. In fact, this was not really a pure matter of picking something you think you like out of a bunch of offers. Some doors closed on me pretty early on. For instance, in a flash of enthusiasm, I tried to get in touch with an eco-village outside of Buenos Aires in Argentina. My hope was that I would be offered an internship in their permaculture centre for a couple of months. No reply. I also realized that what I was asking for was not very reasonable, as taking care of long-term interns would mean an increased work-load for those in offering the internship. I abandoned the idea of doing an internship. I admitted to myself that I tend to heavily romanticize manual labour and practical activities while immersed in academia. Instead, I started browsing websites of a handful of universities, more or less well-known. The universities each presented a well-polished virtual façade, beyond which it was difficult to reach. I believe a genuinely-informed choice could only have been made had I had the opportunity to visit these places and get a feel for what a website cannot mediate. What are the students like? What are the professors like? What are the dominant attitudes and energies? Would I feel comfortable? Would I be able to work and learn in this space? I feel these questions are potentially ever more urgent than asking about what classes the university offers – no class will ever prove valuable unless taught in a nurturing environment. This realization is part of the reason why I decided on McGill University in Montréal, Canada. McGill is a traditional research university—among the oldest in Canada—with a student body of around 34, 000 including both undergraduates and graduates. After two years under the wing of the tiny liberal arts community of ECLA, McGill seemed like an interesting, albeit temporary, switch. After four months of going to class and speaking to people at McGill, I could cite numerous students who, like me, find the McGill community imbued with a competitive, individualistic and thus potentially damaging impetus. No wonder that the campus is full of small stickers and posters offering a range of services for students wrecked by stress, instability and the like. It is very likely that a majority of McGill students would disagree with me. However, my point is not to say that ambition is always harmful. It is just a matter of how energies are channelled. 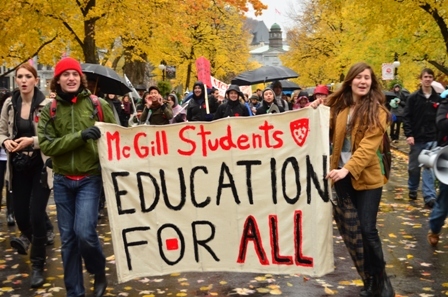 Often, in cooperation with students from other universities in the city, students at McGill organize their own projects. I was happy to see that here collectives serving free food on campus are standard building blocks of the social fabric of the university. Recently, a bunch of students created a platform for alternative, free-of-charge education informed by ideas of collective learning. Additionally, there are a myriad of opportunities to get involved in on-campus reading circles, publications, green-house activities and solidarity networks—all of which invigorate the traditionally-rigid structures of university studies. Finally, I should acknowledge my peers’ centrality to my learning experiences thus far. It is definitely my fellow students who have made the time spent in class more than worthwhile – a desirable dimension of McGill is that it has the resources to break also the largest lecture-classes into small discussion sections, where students have a chance to share thoughts and questions and learn from each other. Group projects and peer-editing sessions are also standard building-blocks of most classes here. For me, as someone who is not bound by a specific major- or minor-programme here, this anatomy of teaching and learning has given the opportunity to blend with and learn from students from a host of different departments and schools. This is how I have made sense of my new environment. Not only have I made sense of it, I like it here. On some level, I even feel like I belong. As for the coming semester: I am excited, to say the least.